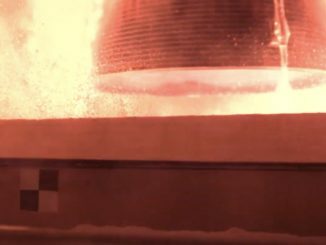 Arianespace and CNES, the French space agency, have released sensational slow-motion video from shielded engineering cameras at the Ariane 5 rocket’s launch pad in French Guiana, showing the launcher’s fiery evening takeoff Feb. 5 with communications satellites for Saudi Arabia and India. 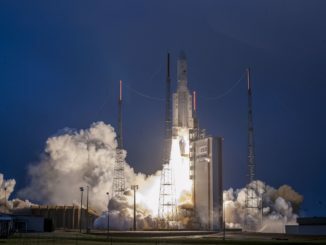 Two communications satellites owned by Saudi Arabian and Indian operators rocketed into orbit Tuesday on top of a European Ariane 5 rocket, the first of up to 13 launches planned from French Guiana this year. 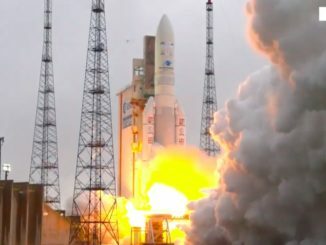 An Ariane 5 rocket launched Tuesday at 2101 GMT (4:01 p.m. EST) from French Guiana with a communications satellite to provide broadband and television services for the government of Saudi Arabia and commercial clients across Europe and the Middle East, and an Indian payload to help bridge the digital divide in South Asia. 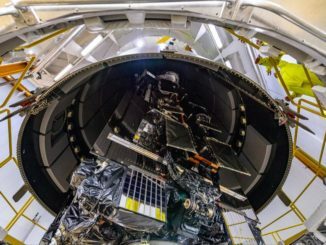 A European Ariane 5 rocket is scheduled for blastoff Tuesday from a jungle launch pad in South America with two geostationary telecom payloads — one owned by a Saudi Arabian operator and built in Colorado by Lockheed Martin, and another for India’s space agency. 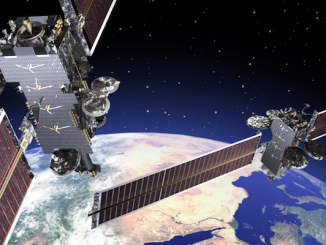 Lockheed Martin will build two communications satellites for Saudi Arabia’s Arabsat, and Arianespace and SpaceX will launch the commercial relay platforms under contracts valued at $650 million announced Wednesday.